Orange is like previous years again an awkward flight on the day of discharge to a pigeon clocks. Only a 17 many pigeons ( of the 5000 ) knew a higher speed above the 1000 metres to pick up. The pigeons to be by the Rhone Valley where they often have hard against wind with warm weather. Unfortunately nothing by itself on the day of discharge. 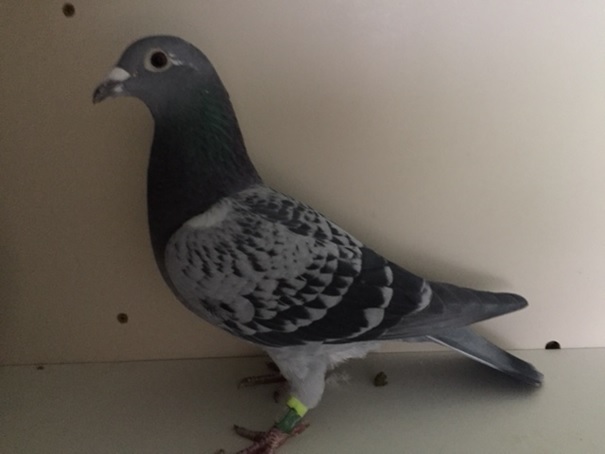 The next morning arrived that 1e Pigeon 08.36 It was the yearling hen 16-1146607 Daughter of Young Barcelona x the blue Lady. This yearling hen has the so in the genes to also under severe conditions to come home just as her parents. Despite the heavy flight pigeons came well after considering there 11 yearlings had. Unfortunately no real early leading pigeons but have a pretty selective and instructive flight for the yearlings!!! It was nice to hear that Klaas Mulder from Hengelo with a grandchild of Benjamin x daughter Marianne 12-881 a 5e NPO Orange played.